Japanese photojournalist Murayama Yasufumi, who has visited Viet Nam 36 times to take photos of the country and its people since 1998, is determined to get official approval to take photos of Viet Nam's Truong Sa (Spratly) Archipelago. More than a month before China illegally put its Haiyang Shiyou-981 oil rig in Viet Nam's exclusive economic zone, Yasufumi said he was making plans to visit the archipelago to take photos and work with Vietnamese colleagues. One month has passed since the oil rig began illegally operating in Viet Nam's exclusive economic zone, but Yasufumi still hopes that he will be allowed to board a Vietnamese patrol boat and work with Vietnamese journalists reporting on China's aggressive action. The freelancer, who will return to Viet Nam on June 19, told Viet Nam News that he had applied for permission to visit the islands through the Foreign Correspondents Club in Viet Nam. 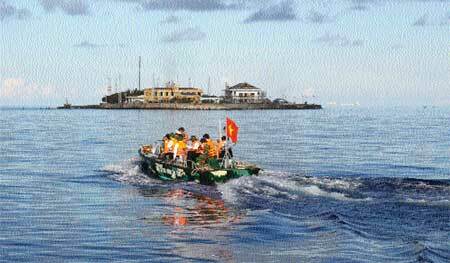 "The first thing I will do when I step on Spratly Islands is to take photos of the land. I am not researcher and I don't intend to do research about the natural resources and geography there. I have read a lot of historical materials about the islands and I think Spratly and Paracel archipelagos belong to Viet Nam," he said. The 46-year-old photojournalist said that he had taken thousands of photos of Viet Nam but none of Truong Sa islands. "I think I am a real Vietnamese in a way. Japan is in the same situation with Viet Nam, so I want to do something helpful for the country. I think Viet Nam and Japan should collaborate to deal with this issue," Yasufumi said, adding that he had received a letter a few months ago from the HCM City War Remnants Museum about his donation of photos. The museum also expressed support for his planned trip to the Spratly islands. He told Viet Nam News that visiting the Spratlys might be difficult to achieve but that he would never give up. He said that China's action was not acceptable. "Rudely taking other people's things is considered the behaviour of a robber," he added. After each trip to Viet Nam, Yasufumi said he returns to his home country to work hard and save enough money to return to his favourite country, Viet Nam. Each year, he travels to Viet Nam on one or two occasions to meet local friends. He first came to Viet Nam 16 years ago on a tour that took him to Japanese photojournalist Bunyo Ishikawa's photo exhibition at the War Remnants Museum in 1998. "I promised myself that Viet Nam would be the only country I would learn about during the rest of my life," he explained, adding that a photojournalist should explore one country in depth instead of many. In September 2006, he called for financial support from the Japanese community to bring a Vietnamese girl to Japan for an operation. Do Thuy Duong, an Agent Orange victim, then aged 18, underwent major surgery at Kyoto University Hospital so that she could receive prosthetic parts for her body. With more than 100,000 photos of Viet Nam, Yasufumi has organised numerous photo exhibitions in Viet Nam, Japan and South Korea, and plans an exhibition in New York. Born to a poor family, his father suffered from drug addiction and left the family before committing suicide.